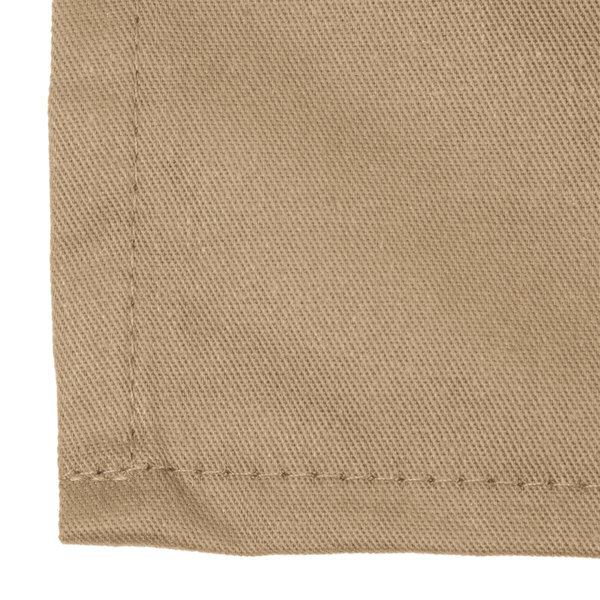 Keep employees looking crisp and uniform with this Choice khaki full length bib apron with pockets! 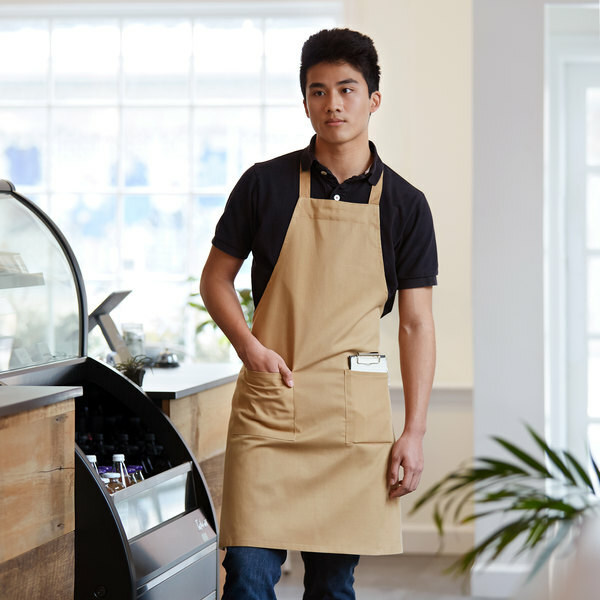 A stylish alternative to plain bib aprons, this Choice apron boasts a curved silhouette and strong, low ties for an adjustable, superior fit. 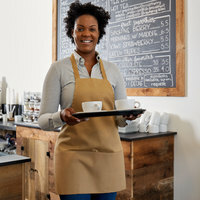 Plus, its khaki coloring adds a bright pop of color to restaurants, bistros, cafes, and catered events. Protect your barkeep or waitstaff from inevitable messes while changing kegs, taking orders, or serving customers with this versatile apron! "These aprons are the perfect size and length, saved a lot of money too on them. 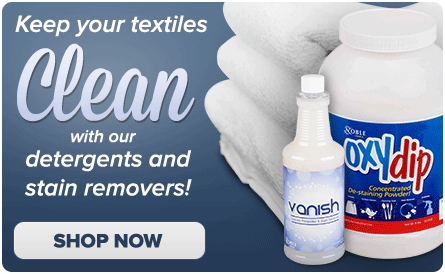 Highly recommend for restaurants since they hold up very, very well no matter how many messes or washes they take!" It offers a cool, clean look and will help create a sophisticated appearance in any establishment. 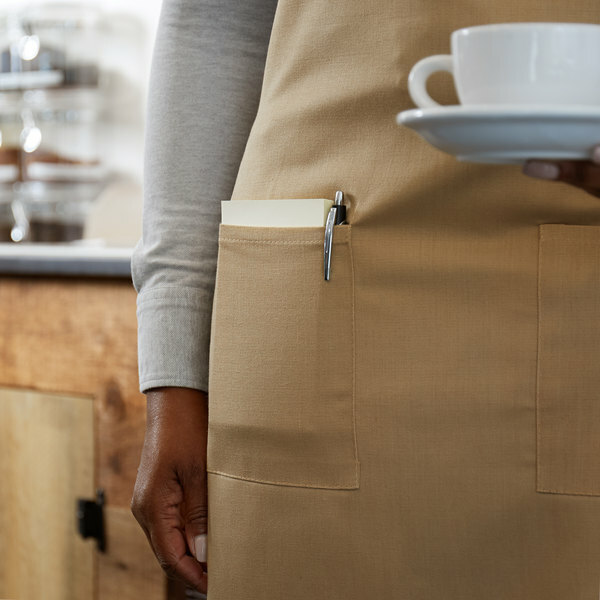 Kitchen staff will look picture perfect staying on top of hot coffee and ice water refills, running steamy tomato soup specials, and topping apple pie with a dollop of whipped cream in this classic khaki apron. The Choice apron are a great option in the kitchen and are pretty durable when it comes to long lasting. I've gone through multiple aprons that have stained or shrunk after washes. very nice aprons, heavy duty fabric, long strings to tie and pockets are handy. Have washed these several time now and they keep their color well. THESE ARE A DECENT APRON,NICE QUALITY, CONVENIENT BIG POCKETS. THEY WASH NICELY,BUT THE KHAKI COLOR IS LIGHTER AND SOME STAINS DON'T COME OUT,BUT THEY DON'T WRINKLE. This apron is the best ever! I don’t need to use bleach to wash them clean. I use white apron then I have to. All my employees preferred this over white, they said matched to their outfits. This is a nice material compared to the ones we receive from our laundry service. I was debating to buy these for my employees in lieu of laundry but I'm just undecided yet! I like these aprons because they're durable. I chose the camel color because I use a similar colored batter in my business that tends to make a mess. The camel color helps to disguise the splatters of light brown batter. This giving a cleaner appearance to the public. I use this color for doing dishes.The collar is wide and does not cause discomfort around the neckline. I use the top pocket to hold test strips. These are made of a great quality that holds a logo well. 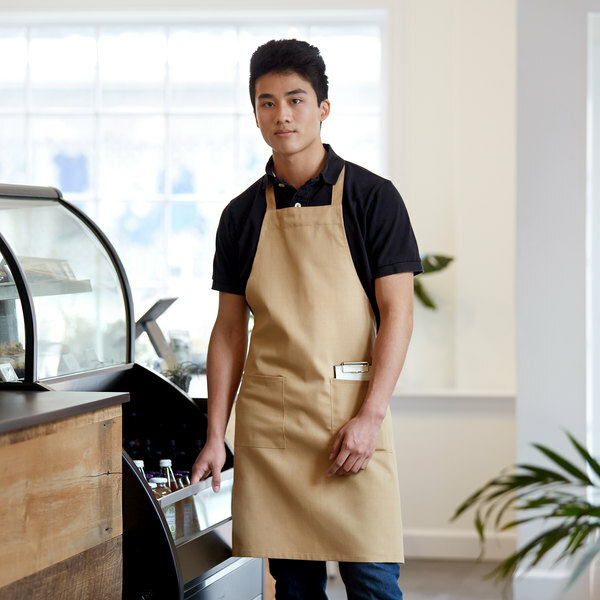 For the cost, we would highly recommend these Bib Aprons with or without pockets. these aprons are very durable. 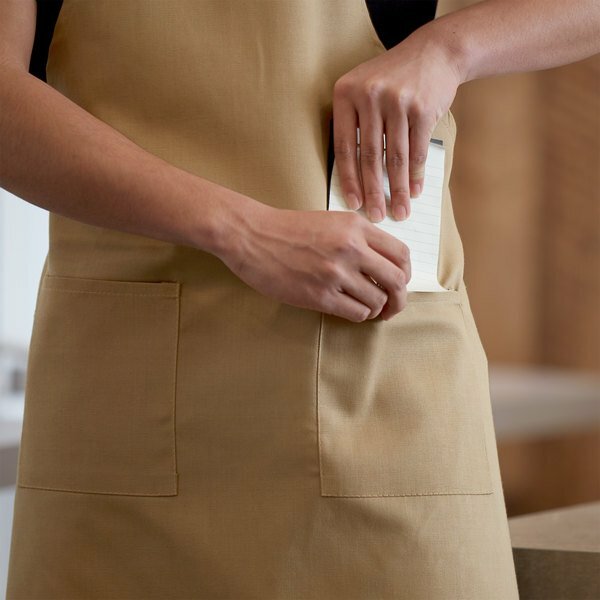 Protect your barkeep or waitstaff from inevitable messes while changing kegs, taking orders, or serving customers with this versatile apron. 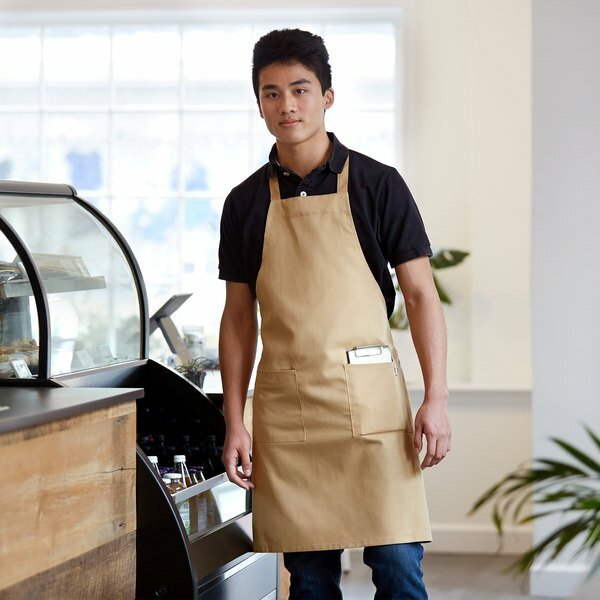 this khaki beige full length bib apron with pockets is very high quality and the straps on top is very comfortable and trendy .I highly recommend buying these aprons . Perfect apron for baking. The quality on them is great, and the full length is great. Having the front pockets comes in handy as well. I love the quality and size of the aprons. I placed a order on last Wednesday and I received the order on Saturday. I have ordered from many companies this is the fastest I have ever received my merchandise. Thank you for you excellent service. This is the most cost effective, durable and comfortable apron ever. I am truly satisfied with the strength of the fabric. I just got a very good buy. These are your standard, cost effective aprons. Nothing special, but very much needed when we do most our baking. Great product and gets the job done. Love these aprons. I hand embroider them for clients. They are so durable and wash up really well. The best aprons I have found. Love love love them. I've got a few of these bibs. They seem to hold up well to repeated use and washing so when I need more I'll get these again. I absolutely love this product! 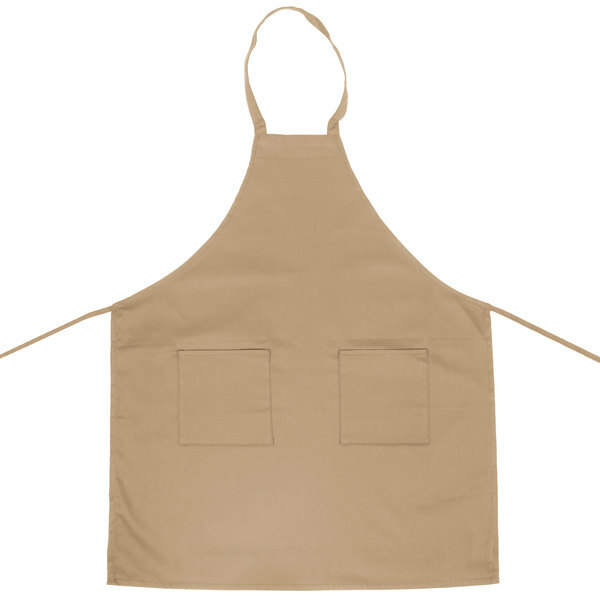 This choice khaki full length bib apron with pockets is great for our restaurant cooks and preppers! This apron is great quality! Perfect size and great quality, comes in different colors and lengths. I order 4 of them, some as gifts. You won't be disappointed about this product.